Folksy :: Buy "Summer Swallow, Unique Hand Embroidered Yarn & Felt Brooch"
Folksy :: Buy "Japan Appeal Item! Spring Blossom Embroidered Felt Brooch." Embroidered Flower Vase Brooch with Gingham Ribbon Trim. Folksy :: Buy "Japan Appeal Item! Sunflower felt, ribbon and yarn Brooch." Folksy :: Buy "Flying High! Bird of Prey Yarn and Felt Embroidered Brooch." 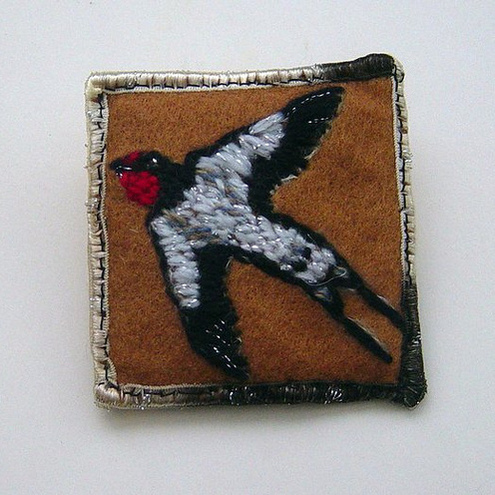 Folksy :: Buy "Seagull In Flight, Embroidered yarn and felt ACEO." Folksy :: Buy "Green Jewel, Hummingbird Embroidered Yarn and Felt ACEO"